This last week we were ecstatic to launch two significant environmental awareness and activism projects with Bethlehem area schools. The two projects have different angles and are funded by two different groups (Canadian and US consulates). In one project we focus more on composting and recycling centers and it involves a different set f schools. In one we develop modules of environmental education. The recycling and upcycling of solid waste is a key component. It was so rewarding to see the spark in students’ eyes grow stronger. Environmental clubs are being set-up at several marginalized schools and in the one school which already had an experience in forming such a club, we helped them reactivate it and guide it it in a productive direction. We work in partnership with the ministry of education and with UNRWA schools and with the Environmental Quality Authority. University students and other volunteers use the experience of helping in this project to empower themselves. Below is a story from one of our volunteers (Doris is 82 years old) about one of the workshops. Thank you Doris, Elias Handal, Mohammad Najajreh, Khawla Abualia, Reena Daeed, Dalal Assi, Mohammad Abusarhan, Jessie Chang, Revien Binas, and many others for great teamwork on this project. I also just gave a talk in Jordan on use of botanical gardens and museums in valuing ecosystem services. Visitors continue to come to the museum from around the world to use the facilities and change behaviors. Tomorrow students from Dar Al-Kalima college will come to learn about fauna and flora. 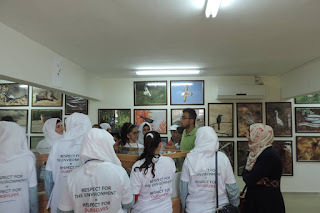 Students visiting the Palestine Museum of Natural History were rewarded with an excitingly different approach to learning, one that involved not only discovery but taking the lead in action to take charge of their future. Traditionally, a lecture approach was considered the pathway to learning, tedious drills driving facts and figures into young minds. Museums were collections of artifacts from the past with little relevance given to the present and less to the future of our planet. Mazin Qumsiyeh, professor and director of PMNH believes in an action approach that takes young people on a path of discovery by learning from the past and present, asking what they want their world to be like then having them take action and develop plans to make the change in the world they want to see. On Saturday, 8th of October, Museum staff welcomed 9th and 10th grade girls and their teachers from Nahaleen School and 7th, 8th and 9th grade girls from Beit Jala School. Discovery began in a lecture room on the lower level of the Mar Andreas building, which houses the Museum on the second floor. Students were each given a bag containing a T-shirt, cap, notebook, pen and ID tag. Professor Qumsiyeh explained how to write data. An introductory film showing field work done at the Museum and research techniques followed. A cartoon representing the “progress” of man in his journey to make “His” life easier graphically showed the negligent impact and lack of concern and living without respect for the environment created. Man’s pursuit of conquering the environment leads to his inevitable demise. The young people “get it” – setting the stage for a will to make change. Encouraged to question and seek their own answers, enthusiasm blisters the room as questions, discussion and responses expand thinking within an environment at odds with outside forces working to restrict creativity. “Change demands collective work,” Qumsiyeh says. A tour of the Museum and outdoor grounds begins with half the group taken to the exhibition room on the second floor of the Museum where Elias, a research scientist, explains laboratory work, while Mohammad leads the other half on a tour of the outside grounds. Olive, fruit and nut trees surround the area; a pond, bee hives and a greenhouse that includes three large fish tanks and hydroponic plants that receive recycled fish water. After lunch, students are given direction by Mubarak, Reena, and Khawla in how to set up an environmental club in their schools that includes an election of officials for their club. The duties of officials were outlined. Minutes of meetings were to be written and reports given at another meeting to be held at the Museum in a few weeks. Students were encouraged to ask questions that stimulate discussion and raise issues leading to solutions. One such question was raised about the future use of electric cars as being a solution to fossil fuel pollution. Yes or no: give reasons for your answer. Can there be solutions and what are they? Another posed the question of how to promote awareness of the environment and who cares more, the younger or older generations. A second group under a different project arrived on Sunday. There were four schools represented – girls from 5th, 6th and 7th grade girls from Virgin Mary School, 6th and 7th grade boys from Beit Sahour (Al-Ta’akhi) School, 10th and 11th grade from Bethlehem Secondary School for girls and 11th grade from Bethlehem Secondary School for boys. In spite of age differences, the groups interacted well showing mutual understanding of environmental issues and coming up with thoughtful solutions. One discussion was about having students cleaning school restrooms. Though hired personnel clean, signs could be made to discourage litter, water waste and care for plumbing. Students said as they looked around the Museum grounds, they got ideas about what they could do in their own schools to control waste and preserve the environment. For example, staking two or three old warn tires, making a seat and painting them colorfully make decorative chairs. Using spent tear gas canisters as holders to germinate seeds or to grow young sapling plants. Qumsiyeh incorporates peace, empowerment, and environment as non-violent resistance to the harsh conditions under occupation. “If we liberate the mind we can liberate our bodies,” he tells the students in introductory discussions about the Fertile Crescent and how important it is to care for this Palestinian landscape treasure. More than depicting just the still life of the past, the Palestine Museum of Natural History is a living entity of the present and the promise of a future placed in the hands of young people equipped with the wings of change. The global environment is facing unprecedented challenges due to human activities ranging from climate change to large scale extinctions to destruction of forests. The threats are diagnosed at accelerating pace and alarm bells are ringing widely about a point of no return that we either crossed or about to cross. More research on diagnosing what ails ecosystem services than on effectiveness of various remedies. Behavioral changes among individuals via environmental awareness and education is considered a crucial component. Here we examine the role of well-structured free-choice institutions of museums and botanical gardens in societal change leading to valuing and preserving cultural and natural ecosystem services. We discuss a case study of a nascent Palestine Museum of Natural History and its botanical gardens now well established as part of an Institute of biodiversity and sustainability. The mission of PMNH is to research, educate about, and conserve our natural world, culture and heritage and use knowledge to promote responsible human interactions with our environment. Much was accomplished so far (see palestinenature.org). For example we explain how school students are using the museum facilities not only to enhance critical thinking and science skills but to develop practical knowledge and create programs that value and protect the rich heritage in nature (and associated cultural folklore of nature). We also engaged in a SWOT (strengths, weaknesses, opportunities, and threats) analysis of PMNH and discuss potential spread of this successful model throughout the region. We conclude that valuing ecosystem services in the MENA region (Arab World) would benefit significantly from expansion of this model in other cities band countries and propose a mechanism to do this via a network of institutions concerned with education for ecosystem services.